The best guide book to become a freelance writer. - Reviews and Responses. Home › products › reviews › The best guide book to become a freelance writer. The best guide book to become a freelance writer. Ever since I have become a freelance writer for various websites, I have been approached by a few retired dads and moms seeking my help to teach them the art of blog writing and article writing so that they can earn their pocket money. I think writing cannot be taught; it comes from within. Unless you have the basic flair to share your thoughts through words, you cannot write a single word. Still, I wanted to help the aspiring freelance writers. I searched for a dependable guide book that teaches people how to write for the web. The author should have been a professional web content developer and the book must have been promoted by some of the Internet Marketers whom I respect and follow. 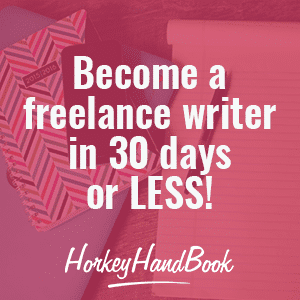 Finally, I came across a guide titled, "Become a freelance writer in 30 days'". It was promoted by the best blogger on earning money online and I respect her a lot. In fact, her regular blog posts are my resource for my blog content. Following her links, I landed on the website of Gina Horkey. After reading her post, I applied to become an affiliate and was approved quickly. Here is her famous and in-depth guide that teaches you to become a professional writer for the web in 30 days or less. Click on the image below and you will be taken to her web page. If you are skeptic about the real value of this guide, you can read the success feedback from those who have bought the guide.